Teatru Astra has come to mean living up to its promises, delivering opera productions with excellent weight and scale and yet all the delicacy required. A completely new production of Verdi's flagship AIDA, which is being staged as the kingpin of the annual Festival Mediterranea, promises to be definitely nothing less than top tier. This is actually the 3rd. 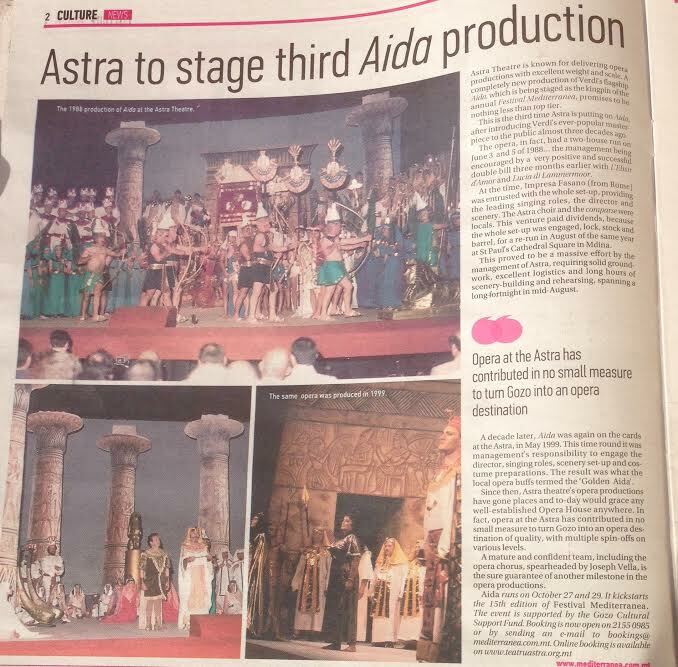 time that Teatru Astra is putting on AIDA, after introducing Verdi's ever-popular masterpiece to the local public way back almost three decades ago. Actually, AIDA had a two-house run on the 3rd. and 5th. June 1988: the management being encouraged by a very positive and successful double bill three months earlier with L'Elisir d'Amor and Lucia di Lammermoor. At the time, Impresa Fasano (from Rome) was entrusted with the whole set-up, providing the leading singing roles, the director and scenery. The Teatru Astra choir and the comparse were locals. This daring venture paid dividends because the whole set-up, lock, stock and barrel, was engaged for a re-run on the 24th, 26th and 28th of August of the same year on St. Paul's Cathedral Square, in Imdina. This proved to be a massive effort on Teatru Astra management's part requiring solid groundwork, excellent logistics and long hours of scenery building and rehearsing spanning a long fortnight in mid- August. 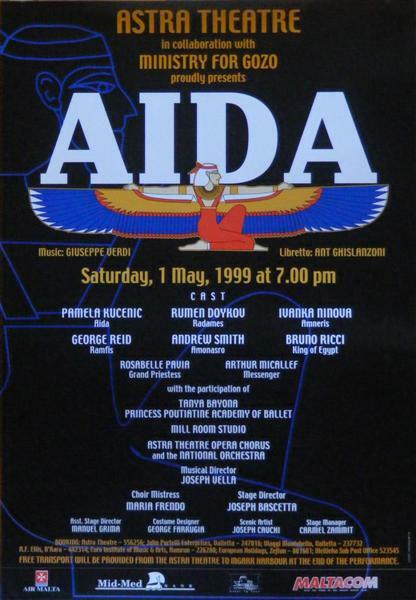 A decade later AIDA was again on the cards at Teatru Astra: on the 1st May 1999. This time around it was management's total responsibility to engage the director, singing roles, scenery set-up and costume preparations. The result was what the local opera buffs termed the 'Golden Aida'. Since then, Teatru AstraÃ¢s Opera productions have gone places, and to-day would grace any well-established Opera House anywhere. In fact, opera at the Astra has contributed in no small measure to turn nowhere into somewhere (i.e. Gozo as an opera destination of quality), with multiple spin-offs on various levels. Indeed, there is hardly anything better than sheer excellence in turning nowhere into somewhere to the point that October has come to mean Opera in Gozo. A mature and confident team, including the superb Teatru Astra opera chorus, spearheaded by Malta's doyen in the musical field, Prof. Joseph Vella, is the sure guarantee of another milestone in the opera productions. With regards to the Teatru Astra, the past is the guarantee of the future. For more information, please browse through www.mediterranea.com.mt.